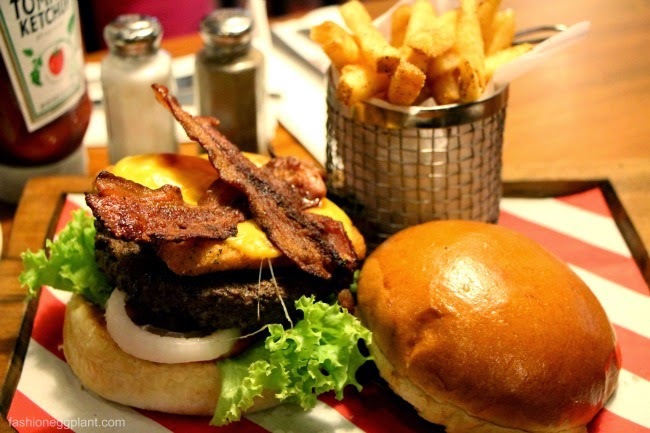 Can you believe it's already been 20 years since the first TGIFridays branch in Manila opened? I feel so wholesome now relaying that...to think it already made me feel so cool to be out on a Saturday! Nowadays, it's all about clubbing, back then, it was chicken fingers and enormous desserts shared among us. Old habits die hard and to this day...20 long years after, TGIFridays is still one of my favorite dining destinations. To celebrate 20 years, their Glorietta branch re-opened with a new look and a new menu! The new look is modern and less cluttered which makes for a lighter, brighter and younger atmosphere. On days when you feel nostalgic, they have still maintained the red and white them all around plus a Heritage Wall depicting TGIFridays history and the journey of its founder, Alan Stilman. "By tracing the past, one would understand the values that the restaurant displays with pride to this day: commitment to serving good food and providing great service dashed with loads of fun." There's also a notably larger bar set smack in the middle of the whole area so their famous bartenders have more space to showcase their skills and tricks. But what I enjoyed most during my visit was the food! Four deliciously new dishes have been added to their menu and they are mouth-watering, diet-shattering good! At P295 for most of these, TGIFridays is my new favorite place to have lunch. First up, Grilled Pork Chops in Shitake Cream Sauce - dry rubbed and fire-grilled pork served with rice pilaf and summer coleslaw. Each bite was heaven. The pork was perfectly seasoned and cooked, decently thick to satisfy even the largest of appetites. The pilaf was super yummy and the slaw was there to even the flavors out and take the "umay" out (reminds me of the Man vs. Food philosophy which really works). ps. the sauce/gravy is super delicious, try to ask for more if you can. At first glance, I thought I was being served chicken cordon bleu but these are nothing like it. They're way more imaginative with a spicy kick to keep things interested. One serving is super generous and I can't imagine finishing the whole thing by myself. I'd probably order a salad and half this with somebody. My favorite out of everything we've tried: the new Stacker Burgers - "one great buger, stacked with flavor"
Something I will never be able to resist: The Cheesy Bacon Cheese Burger: I can't decide which the best part of it is...the crispy bacon, the layer of fried mozarella or the juicy beef patty...it's sinful and I can totally have it everyday. YOU NEED TO TRY THIS! For those who love their meat, try the Texas Chili Cheese Burger. As if one humongous beef patty wasn't enough, they decided to top it generously with chili. The over-all effect is like having a 3-inch thick super juicy burger patty. Also, make sure to watch out for the new Stacker Burgers which will be launching this May 19, 2014! TGIFriday's is my favorite family and go-to restaurant! I've only eaten at their Glorietta branch maybe 3 or 4 times, and it did look outdated then. Glad they re-opened with a new look!